However, for a business owner, you likely want something with a bit more power. There are several enterprise-level solutions available to the business owner seeking to take advantage of cloud computing, and Michell Consulting Group (MCG) can help you integrate the best cloud solution into your infrastructure. Better yet, most are scalable, so you’ll get exactly what you need for your business. Additionally, you can know that only authorized individuals will have access to your confidential data in the cloud, and you can augment this with advanced reporting and monitoring capabilities. If you opt for an enterprise-level cloud solution, you won’t have to deal with managing this risk yourself. MCG takes care of the hard work, which saves you time, energy, and resources which are better spent elsewhere. Your data security is our primary concern, and it’s our job to deliver quality results to our clients. Due to the fact that an in-house IT staff can be stretched thin quickly due to their day-to-day responsibilities, they don’t have time for mundane routine tasks like maintaining cloud security. Let us lighten their load so your IT team can focus on more important technology initiatives. Not only can MCG monitor and maintain your cloud data, but we can also back it up with our Backup and Disaster Recovery (BDR) solution. You can know that in the event of a data breach or a natural disaster, your data can be recovered quickly and efficiently, with minimal downtime. If you have questions concerning cloud computing for your business, our professional tech support team would be happy to answer them. Give us a call at 305.592.5433 ext.2601 to learn more about how to integrate cloud services into your IT infrastructure. The truth is, there are several ways to lock down your device. Due to these options, choosing to not lock your device seems rather silly, yet some people view unlocking a phone every time it’s used to be a hassle. It might take a few extra steps whenever you need to use your phone, but in today’s harsh reality, you’re turning your device into a security hazard by not locking it. Once you get into the habit of unlocking your phone, before you know it, you’ll be performing the unlock feature so frequently that it will become habitual. The first step toward locking your Android device is to enable the lock screen. For example, on Samsung’s Galaxy S5, you can access these features by going to Settings > Lock Screen > Screen Lock. You’ll be given several screen lock settings to choose from, depending on what device you are using. We’ll cover four of them: Pattern, PIN, Password, and Fingerprint. For today’s tip we tell you how to keep your Android correspondence safe. As you can see, there are plenty of settings. Any of them are viable, but depending on your security needs and lifestyle, some might provide a better solution than others. Besides, even a simple lock feature is better than no lock feature, right? Here are your choices for an Android lock screen, in order of security. 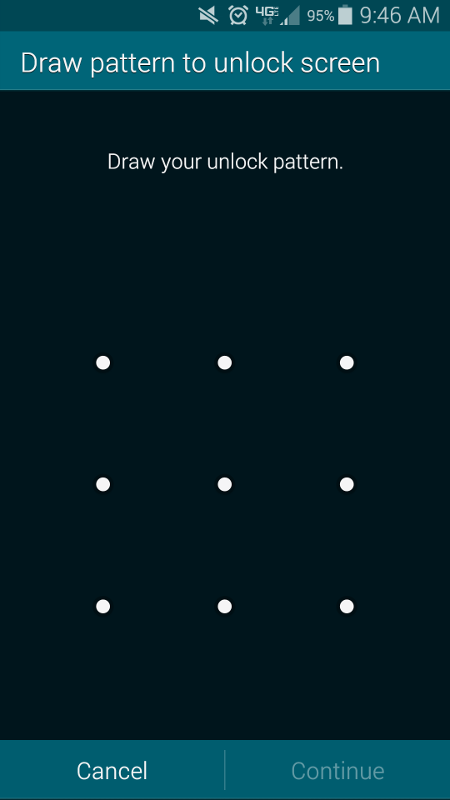 One of the more simple ways you can lock your device is by using a pattern-unlock. This particular method consists of swiping the screen a couple of times to draw a pattern on a three-by-three grid. The user must then replicate the pattern in order to gain access the the device. This might seem like a solid way to keep your device secure, but it’s easy to plug in an overly simplistic pattern like a couple of straight lines. Spice it up a little and make a pattern that’s difficult to guess. You want to make it as difficult to access as possible, or else a thief could accidentally find the combination in a few simple strokes. You’re already familiar with Personal Identification Numbers, so you probably already know how they work. 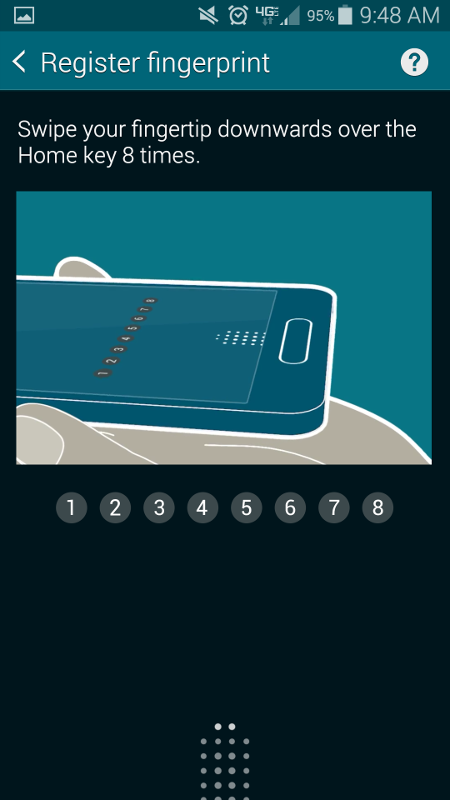 You choose a string of numbers which are used as a pass code to unlock the device when you need to use it. 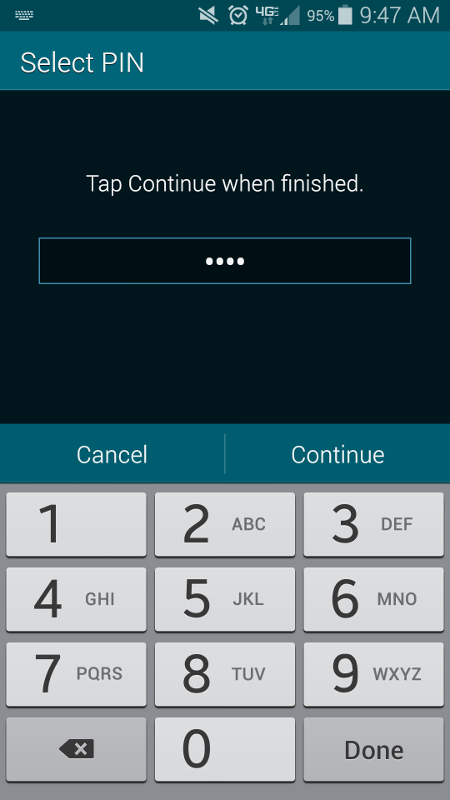 Of course, if you use a simple PIN that’s easy to guess (like 1,2,3,4), you might as well not even have a lock on your phone. Therefore, it’s recommended that you use a longer PIN with lots of different numbers for maximum security. Just like any desktop or laptop PC, you can use a password to keep your device locked. While a password is much more secure than a PIN or a pattern lock screen, it can be the most time-consuming lock for your device. When using a password for your Android device, you want to make sure you take into account the same variables that you would for your desktop PC. Use a variety of capital and lowercase letters, numbers, and symbols, in order to maximize security. Some new devices, like the Galaxy S5, come equipped with a fingerprint scanner. This is perhaps the most secure way of locking your device. Unless the thief can somehow replicate your fingerprint, they won’t be able to get in. 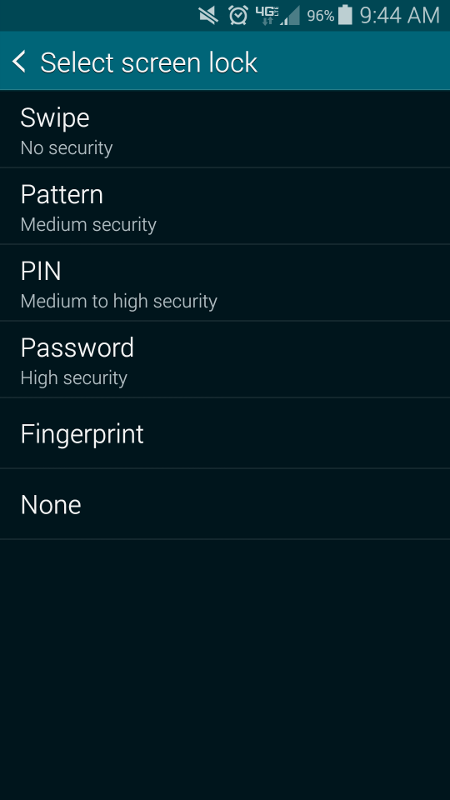 To use this feature, you need to register your fingerprint to the device. To do this, swipe your finger along the Home button eight times. This lets the device get a good feel for your print. 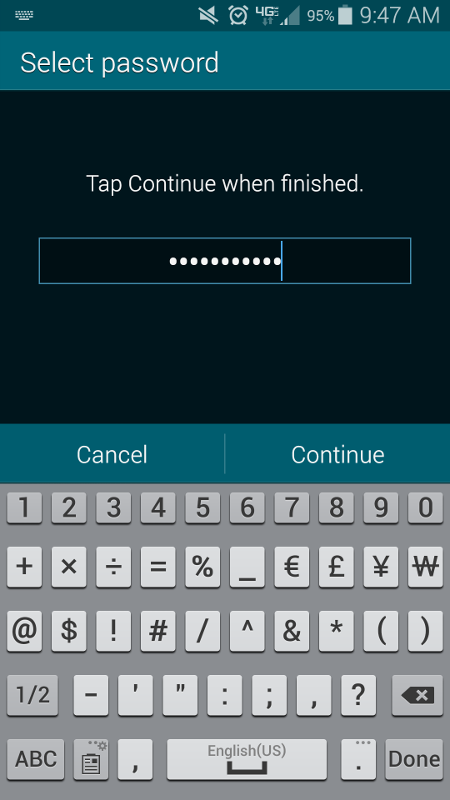 You can then set up an alternative password in the event that your device can’t recognize your fingerprint. There’s also an option on the lock screen for an emergency call, in case you absolutely need to use your phone in a pinch. Locking your device’s screen might keep petty thieves and crooks out of your device, but in the hands of a seasoned hacker, it’s child’s play. They can potentially bypass the lock screen entirely, or wipe the device’s data completely. If you want a heavy-duty mobile device security management solution that can prevent data loss in the face of disaster, give Michell Consulting Group a call at 305.592.5433 ext.2601. If your network administrator isn’t scanning your system for issues or security problems, your network could be at serious risk. Security scans are part of keeping your online presence healthy, and are imperative for keeping threats an arms-length away from your system. Even while taking the maximum security precautions, threats can sneak into your system and cause damage. When this occurs, it isn’t your fault; but it’s important to act before it’s too late. With Michell Consulting Group (MCG)’s Unified Threat Management device, your network can be protected from the many threats lurking on the Internet. Our professional and trusted IT technicians can monitor and maintain your business’s network, and detect malicious activity before it can cause irreparable damage. Additionally, we can update your software when it requires a new patch or license renewal, letting you give your IT a “hands-off” approach. While the UTM is a comprehensive security solution designed to help your business avoid problems, it’s not a perfect solution. Hackers are constantly developing ways to take advantage of minor vulnerabilities, and even with maximum security your business could lose everything it’s worked so hard to achieve. When the worst happens (like the recent Sony hacks, which exposed a ton of confidential data), it’s important to have some sort of backup and recovery solution on hand. This is especially important if your business wants to keep uptime at an all-time high and limit the loss of data. MCG offers a Backup and Disaster Recovery solution designed to keep data loss and downtime to a minimum. You can know that, be it natural disaster or hacking attack, you’ll be able to restore your data to the point right before the disaster struck. The BDR solution includes a device which acts as the server in the event of unexpected downtime, allowing you to keep operations moving. Redundancy is a term often used when discussing data storage in the business world. What this means is backing up your server’s data on another identical server. This is one way MCG’s solutions help your business stay afloat in the event of an outage. Additionally, this means that uptime is practically guaranteed, and maintenance can be done after-hours without causing expensive downtime. MCG understands how important the latest technology is for your business. We can arm your company with cloud-based servers which come with a variety of benefits. These include reduced costs on maintenance, electricity, and general upkeep costs. With fewer operating expenses, your assets can be allocated toward more lucrative venues. By paying attention to these three network security aspects, you’ll be sure to make the right choices concerning your business’s data security. MCG’s professional IT technicians can provide further consultation and support for your business. Just give us a call at 305.592.5433 ext.2601 to learn more. By following these pointers, you’ll be able to lead a healthier and overall more comfortable life while in the office. This, in turn, will increase your productivity levels, allowing you to get more done in the same amount of time. CNet suggests a variety of ways to revamp and improve your workstation ergonomics. You won’t know how to deliver the optimal workstation experience until you find out what your most comfortable sitting position is. Sit down in your chair and relax. You can lean back a bit and even close your eyes (just don’t fall asleep). When your shoulders relax and your hands fall to your lap, you’ll know you hit the sweet spot. Sweet, sweet comfort. Believe it or not, you can work like this all day if you want to. Begin by picturing your ideal workstation setup in your head. Try sitting down just like you were in the previous step, then attempt to use your keyboard or mouse. Your keyboard shouldn’t be more than two inches above the thighs, and should allow your elbows to fall to your sides during use. If your current desk doesn’t allow for this, you may need a keyboard tray. This minor inconvenience lets you clear off your desk even more by getting all of that clutter off of it. By the time you’re done getting the right position down, you should notice that your hands are about a shoulders-width apart, and parallel to your thighs. Afterward, it’s all about getting that wrist position down. Using a wrist rest can lead to poor blood circulation and even pinched nerves, resulting in carpal tunnel. To avoid this, arch your wrists slightly, and at all costs avoid laying them flat against the surface. It’s safe to ignore the stands on the bottom of your keyboard, as they don’t offer anything that a better posture doesn’t. The last part of organizing your ergonomic workspace is choosing whether to get rid of your old chair or keep the one you have. If it’s not offering proper lower back support, you might want to consider an upgrade. However, if it has proper lumbar support, you should be fine. Make sure there’s a bit of space between the back of your legs and the seat of your chair. If your feet are still hanging after your adjustments, pick up a nice comfy footrest to prevent jello-foot syndrome (when your feet go to sleep). Naturally, people work best under the most comfortable conditions. If discomfort is distracting you or your employees, it can be preventing them from reaching the maximum level of productivity. Do you have any favorite methods to increase comfortability in the workplace? Let us know in the comments.